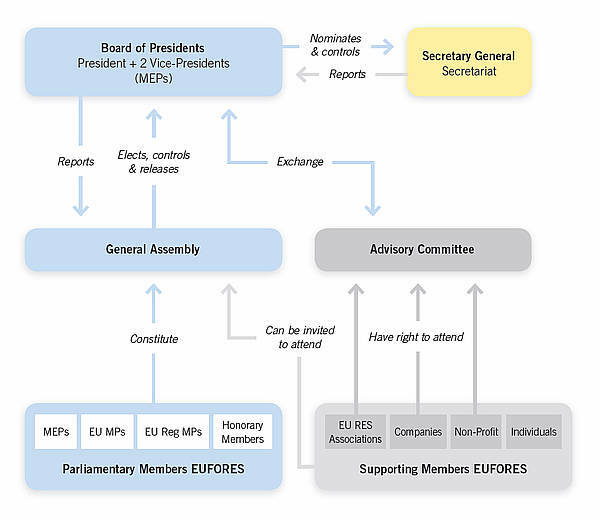 EUFORES has undergone an intense and successful reform process in 2008. The new Charter developed by the EUFORES Secretariat has been approved by its General Assembly in September 2008 and applies as of January 2009. EUFORES reformed its charter in order to better reflect and support EUFORES’ goals and activities. The General Assembly is the organisation’s main decision-making body and is made up of all the full members. Among others, its responsibilities are the approval of activity reports and budgets. The Board of Presidents, the organisation’s governing body, consists of three Members of the European Parliament (the President and the two Vice-Presidents) who are appointed by the General Assembly. The Secretary General is in charge of the day-to-day operations of the organisation. The Advisory Committee, consisting of all core supporting members, shall exchange ideas and views with the Board of Presidents regarding policy developments and strategies in the area of renewable energy sources. Non-Parliamentary Members: Supporting Membership for EU Industry Associations, Companies, Non-Profit-Organisations and Individuals. To learn about the membership categories, rights and fees please consult our membership section.